Large city with a population slightly over one million and it is the administrative center of Volgograd Oblast (Волгоградская область). Formerly known as Stalingrad (Сталинград). Large city with a population of just under one million and the administrative center of the Perm Krai (Пермский край). Seventh largest city in Russia and the administrative center of the Omsk Oblast (Омская область). 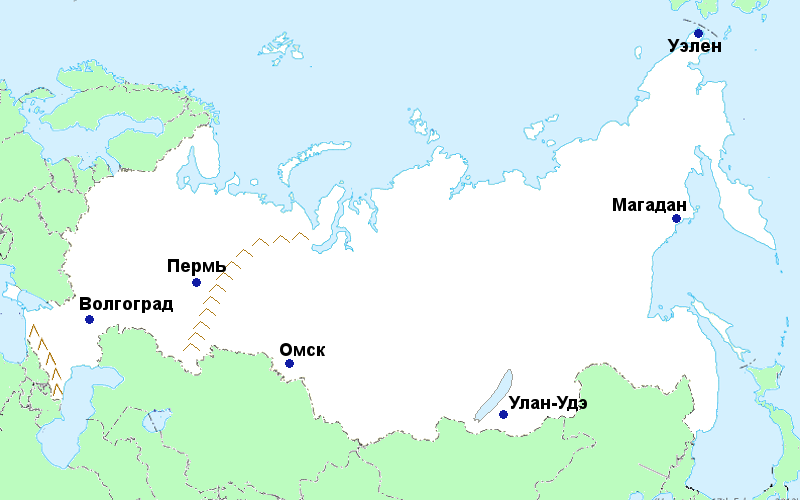 Located east of Lake Baikal and is the capital city of the Buryatia Republic (Республика Бурятия). Located in northeastern Russia and it is administrative center of the Magadan Oblast (Магадан область). Small town of only 700, located just south of the Arctic Circle in northeastern Russia and officially recognized as the closest permanent Russian settlement to the United States. It is contained within the Chukotka Autonomous Okrug (Чукотский автономный округ), also known simply as Chukotka (Чукотка). Омск - седьмой по величине город России.